Here at Ding How, all of our dishes are cooked to perfection with the freshest ingredients. Everything from the meat down to the vegetables, and even our sauces are hand-prepared daily. We prepare each meal with traditional Chinese cookware and techniques, which allows us the opportunity to provide San Antonio with a taste of authentic Chinese flavors. Experience a burst of flavor, when you try our NEW Spicy Garlic Shrimp Noodle dish, pictured above. We know that during lunch, you’re crunched for time. That’s why we’ve spent so much time training our staff to provide friendly service, while serving you delicious, hot, Chinese cuisine in a timely matter. Don’t have time to dine in? No worries. Ding How offers to-go! To place a to-go order, please call (210) 340-7944. Ding How is the perfect place to dine with your family. Our menu offers something for everyone, with over 100 menu items to choose from. We also offer a variety of health conscious options including our Mixed Vegetable Plate (pictured above), Chicken with Broccoli & Chicken with Almonds. Opt for our perfectly steamed rice and you’ve got yourself a nice alternative. Upon request most of our stir fry dishes can be prepared gluten free or with no MSG. You may not know it, but everything about the architecture and décor of Ding How was put in place by a Chinese architect for the purpose of good luck, good fortune, and good wealth. The little details that surround, will give you a glimpse into traditional Chinese architecture. In Chinese tradition, red symbolizes good luck, while green symbolizes health and prosperity. We designed our building exterior, including the brick walls, red stilts, and our green roof top with all this in mind! As you enter the building, you're welcomed by a grand fountain that was put in place based on the ancient Chinese practice of Feng Shui, in an effort to evoke good fortune. 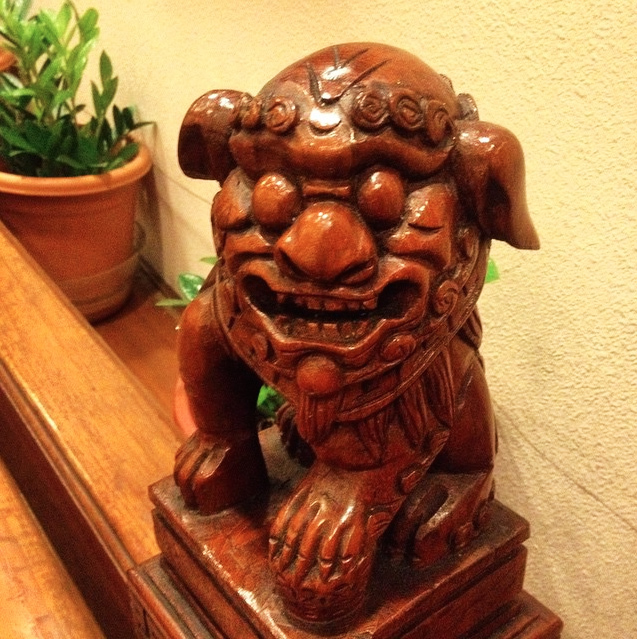 Walk up the hallway to the foyer and you'll notice the hallway is lined with wooden kirins, a mystical Chinese creature that wards off evil spirits. Welcoming you into the foyer is a large jade elephant. Green jade is a symbol of good luck, wealth, and good fortune. Don’t forget to rub the elephant's head for good luck on your next visit! We value our heritage and hope that our customers feel like part of the family when they come to dine with us. Thank you San Antonio for making Ding How part of your tradition and we hope to welcome families, old and new, for many more years to come! Ding How would not be here if it weren’t for our great great grandfather, Mr. K. A. Huey. He traveled to the United States in 1916 as a chef, hoping to open his own restaurant, and pass his knowledge of traditional Chinese cooking down to his children. In 1938, his dream came true when he opened his first restaurant, Hung Fong. Hung Fong still exists today as the oldest Chinese restaurant in San Antonio, located 3624 Broadway. Here, he taught his son, Maury Maverick Huey, the art of running a successful family business; and in turn, Maury Maverick trained his own two sons, Maury Maverick Huey, Jr. and Maurice Huey. Today, Hung Fong is run by his grandson Maverick, Jr.. Since Maury Maverick had two sons, he figured he needed two restaurants. One for each son to run. So, in 1983, our family opened Ding How, located on the corner of Loop 410 and Callaghan. It is here where Ding How blossomed. Maurice and his wife, built the business from the ground up. Since 1983, they have spent countless hours creating a welcoming atmosphere ideal for sharing a delicious meal with friends and family. Recently, one of Maurice’s children moved back to San Antonio from New York to carry on the family legacy, and assist with operating Ding How. Together as a family, we operate the business, alongside an amazing staff! Many of whom have been working with the entire family since we opened for business more than 30 years ago. Our family hopes to serve San Antonio fine Chinese cuisine for many years to come!